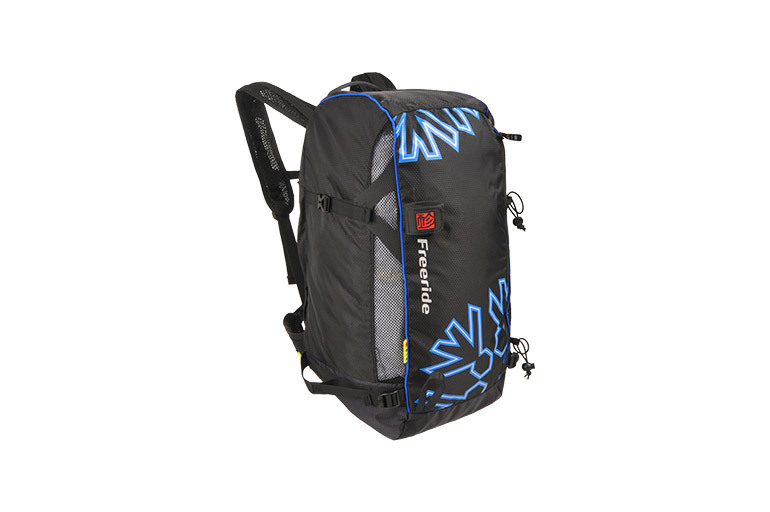 The Freeride harness is the reversible harness / rucksack of choice for experienced and expert speedriders. Lighter and less bulky than its predecessor, it is perfectly suited to off-piste and wild area use. The improved bag shape offers greater vertical capacity and a concealed zipper system. 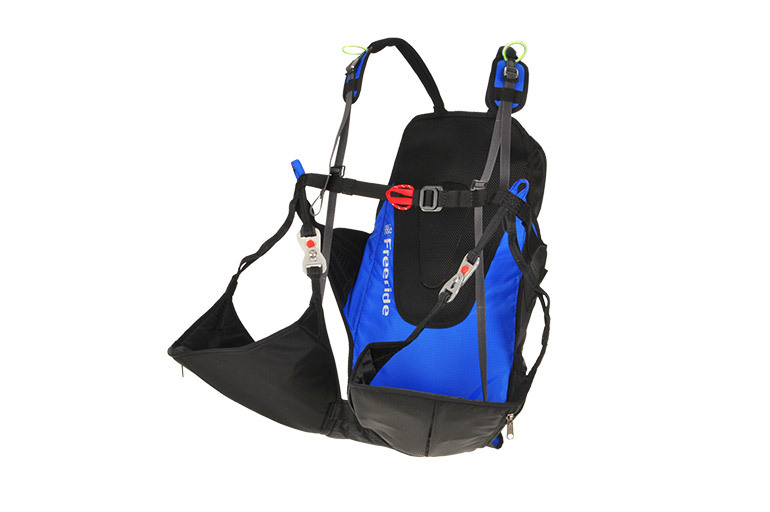 The rucksack side of the harness has new ski and equipment Hypalon attachments for touring. An avalanche shovel can be stowed in the front pocket and there are specific attachments for telescopic poles and an ice-axe. The new ergonomic shape and ventilation system on the back makes it very comfortable to carry, even on a long walk. The shoulder and lumbar straps mould to your body shape with 3D mesh. 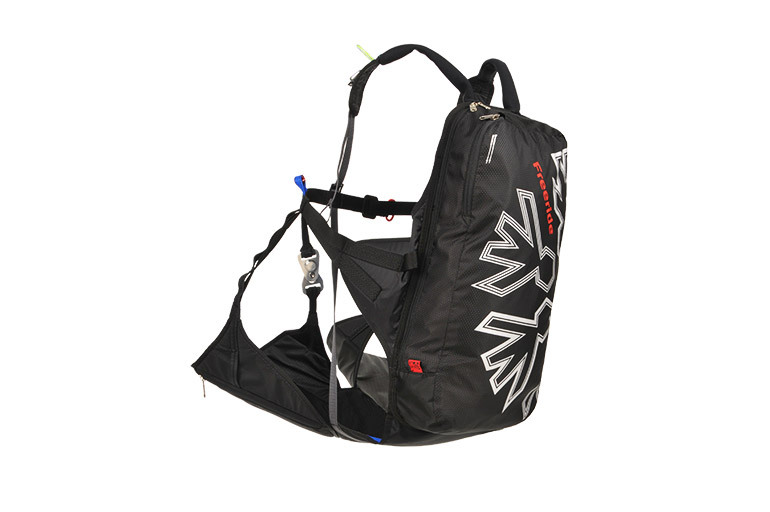 This rucksack enables storage of the harness and the glider in separate compartments. To convert the rucksack into a harness, just turn it inside out. Legs are independent and the shoulder straps slide through the front cross strap for greater comfort when skiing. These and other technical features give you more comfort and precision in use. > The anti-puncture plate and back protection is fully integrated between the bag and the harness. > The harness shoulder straps have been designed to mold to your body and to follow your movements. The harness geometry provides an improved fit when the speedrider is in the standing or semi-seated position. > The new double leg straps system allows more precise piloting. In addition, a rubber strap allows the the leg straps to automatically mold to your thighs. A ‘sock’ pocket enables the storage of telescopic poles during runs without the risk of snagging on the glider lines. The harness still has enough volume to accept clothes and a snow probe. While wearing the harness, the ‘Fast pack bag’ (optional) is very useful in the zipped pocket on the right leg. No doubt that this ‘Freeride’ harness is the ideal tool for wide open spaces!